Department of Communications and the Arts - Introduced in 2016. Its policy responsibilities now include the arts portfolio including cultural affairs, copyright and classification policy. It is responsible for managing the Copyright Act 1968 and is the lead agency for whole-of-government issues on the management of IP. the Australian Government Attorney-General's Department (Commercial and Administrative Law Branch) - a very poor website for being able to find ANY information on copyright! 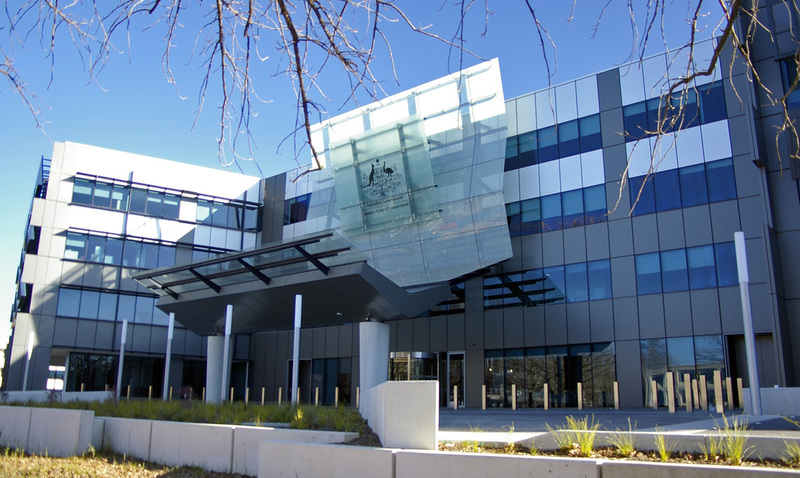 ​The image at the top is the building housing the Department of Communications and the Arts in Canberra. No particular level of literary or artistic merit is required for copyright to subsist in a work. However single words, slogans or titles are not sufficiently substantial to be protected as works. They may be protected by other legal means, such as a trademark or under the Trade Practices Act 1974 (Cth). ​The Copyright Act 1968 is the legislation from which copyright law in Australia stems. Until 2004, copyright in Australia was based on the "plus 50" law which restricts works until 50 years after the author's death. In 2004 this was changed to a "plus 70" law in line with the USA and European Union, but this change was not made retroactive. The consequence is that the work of an author who died before 1955 is normally in the public domain in Australia. Smartcopying - The Official Guide to Copyright Issues for Australian Schools and TAFE - This a reference guide only and is not intended to provide legal advice. Authentic Design Alliance - advocates for the use of genuine design product and helps members to encourage their clients to choose the genuine article. The Australian Law Reform Commission is a federal agency that reviews Australia’s laws to ensure they provide improved access to justice for all Australians by making laws and related processes more equitable, modern, fair and efficient. Copyright and the Digital Economy - available for free as an EPUB for use in mobile devices. The Department of Communications and the Arts manages the Copyright Act 1968 and works on copyright policy in Australia, and international copyright issues. This is a not-for-profit organisation which provides information, advice and training about copyright in Australia. Statement on copyright and intellectual property | The copyright and intellectual property system must ensure a fair and equitable balance between creators, owners and users, and the needs of the public. • Copyright protection is free and applies automatically when material is created. • Copyright does not protect names, titles or slogans. • There are no general exemptions from copyright law for non-profit organisations. The Australian Government administers copyright. Copyright protection is free and automatic in Australia. There is no registration system. Some websites offer copyright protection or to "register" copyright for a fee. These websites have no authority to guarantee copyright protection. Copyright collecting agencies in Australia make sure creators are rewarded for their creativity. They are non-governmental groups which manage the rights of copyright owners. They receive payments, which they pass onto copyright owners. Visual Artists Copyright Collecting Agency (Viscopy) - (NOTE: VERY SLOW WEBSITE!) responsible for licensing copyright in artistic works. It pays the artist or copyright owner a royalty for the reproduction. VISCOPY represents its artist members for the full range of rights, reproduction, publication and communication, thereby providing copyright users with authorised access to thousands of artistic works for commercial, non-commercial and educational purposes. Copyright Agency Limited (CAL), representing authors, journalists, visual artists, surveyors, photographers and newspapers, magazine and book publishers.